As you may recall, I wrote a glowing review of Neo Yokio when it first premiered on Netflix in 2017. A lot of folks hated it, but I found it to be an uproariously funny series. When it was announced that a Christmas special would be made, I was stoked! Well I gave it a watch so let’s dive in and see if this was up to par with the original series or if something was lacking. The general premise of the episode is that Kaz is sick during the holidays so he has Charles tell him a story. Initially it starts off as telling the story of Jesus, but Kaz quickly gets bored of that and some off-color humor about religion is tossed in (I didn’t really mind that, just putting out there because I know some people will care). That’s when you jump right into the story proper. You tangentially follow Herbert, or as many of the characters refer to him as, “Sales Clerk” and the upcoming Secret Santa for Neo Yokio’s most eligible bachelors. Kaz naturally gets his nemesis Arcangelo and vice versa. In addition to all this, a new character is tossed into the mix, Kaz’s French aunt who is a memoir-ist, that isn’t liked by Aunt Agatha. There is also hints that Kaz’s family may have a dark past and that bigger plots may be at play than anybody realizes. Somehow, this is also a commentary on consumerism and Christmas in general too. In a way, this has all of the conventional trappings of any other special for any other series. You have the callback to the Toblerone, references to events that transpired back in the main series, and most of it felt about as natural as this sort of thing can. However, it just didn’t quite feel quite like the Neo Yokio I love. The first point of criticism I have is that the characters did too much swearing. Now, I don’t really care when swearing is in a show, but it was so frequent, and often out of place, that it was rather distracting. Furthermore, there is just a LOT going on in this (just over) an hour special. It felt a bit unfocused. Mind you, this doesn’t mean it was a bad special, but you were a fan of Neo Yokio’s core series, then this may leave you feeling like this wasn’t as good. All that said, there were certainly high points of praise. For starters I loved Arcangelo’s goofy Christmas song, Kaz’s terrible rap, and the pseudo-philosophical Eva-like sequences related to The Pink. I also liked the direction they took Herbert for the story, even pushing him to the brink of suicide when people refuse to shop at the store due to Arcangelo’s, “Christmas challenge” and is subsequently fired. There’s just something about this absurd series getting super real that elevated it even higher than normal for me. As I mentioned, there are messages about anti-consumerism which contradicts the expectations one may have for a Christmas special. Ultimately, Christmas is just a part of the setting, only acting as a vehicle to deliver the obvious critique and set pieces that propel the narrative. So was this as good? No, but I still liked it. 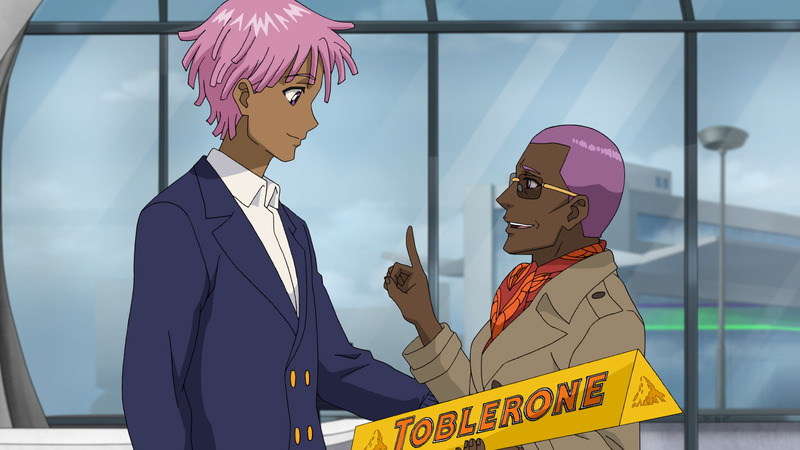 If you weren’t a fan of Neo Yokio already, then this absolutely won’t change your mind. However, if you loved the series like me, then you’ll probably enjoy this, even if it doesn’t quite measure up. 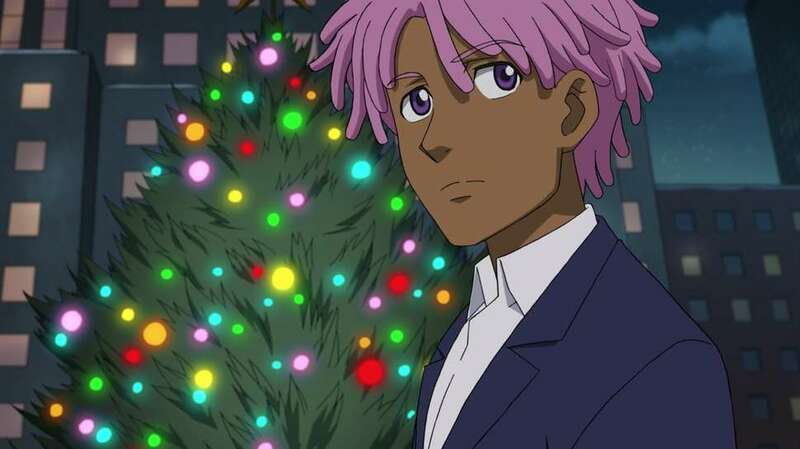 Are you going to check out Neo Yokio’s Christmas special? If you already did, what are your thoughts? Let me hear your voice in the comments below. If you’d like to support my writing here, please click my donation button below as I really appreciate it. Thanks for stopping by and I hope to see you back here again soon at Jon Spencer Reviews! Celebrating the 4th – What Are Your Favorite Firework Scenes in Anime? It’s the 4th and I’m Feeling Lazy! Can You Believe it? This is the Final Post!